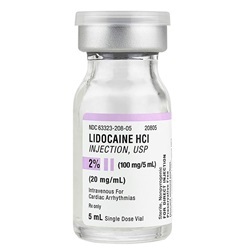 Injectable lidocaine HCI 2% (20 mg/mL), in 5mL multi dose tear-top vial. Preservative free antiarrhythmic agent with a silver cap. Manufactured by Fresenius . NDC: 63323-0208-05. Comes 25 per box.